You've always fed cat food to your cat and dog food to your dog, because — well, why wouldn't you? But if you're like many pet parents, on nights when the dog food runs out and a trip to the store doesn't sound like fun, you might have looked at that bag of cat food and wondered, what's the difference, really? They look similar. They sometimes smell similar. Is it all just the same stuff? Well, we've got the answer. As it turns out, there's a surprisingly big difference between cats' and dogs' nutritional needs, and, therefore, in their foods. We asked Dr. Leslie, Big Heart Pet Brands' in-house veterinarian, to shed some light on exactly what's in dog and cat food and why it doesn't translate well across species. Q: What's the basic difference between dog food and cat food? Dr. Leslie: Cats have higher needs for many essential nutrients, whereas dogs can adapt to life on very little. Cat food, as a result, tends to be higher in protein, fat, minerals and vitamins. Cat food is also smaller for their smaller mouths, and is higher in calories. Many ingredients used in dog and cat foods are similar, if not the same; it's the amounts used to balance the food that vary. For example, cats are obligate carnivores and have a higher need for protein, essential amino acids, fatty acids and many vitamins. Their bodies can't manufacture the essential nutrients at all or fast enough to meet their metabolic needs. So arguably, dogs could eat most cat foods, but cats should not eat dog foods. However, some cat food nutrients are dangerous to dogs too. Q: What are the dangers of a dog eating cat food? Dr. Leslie: Cats have a much higher safety tolerance than dogs to some nutrients. Cats appear to have evolved pathways that allow them to tolerate levels of Vitamin D that could make dogs very sick and even die. Fish- or marine-based cat foods should not be fed to dogs for this reason. It's not difficult to convince dogs to eat, well, anything. But cat foods are made with a bit more fat than dog foods. Dogs prone to fat intolerance should also not be allowed to eat cat foods, as this is a common cause of pancreatitis and digestive upset. Canned cat foods tend to be higher in animal protein sources, which, in excess, can be tough on a dog's system. Q: What are the dangers of a cat eating dog food? Dr. Leslie: A little nibble here or there is not usually a problem for cats. But in some cases, dog food may contain ingredients that are harmful to cats. For example, propylene glycol is commonly used in semi-moist dog foods. It's perfectly safe for dogs, but higher levels can cause health problems in cats. Over time, if a cat were fed only dog food, then protein, amino acid and fatty acid deficiencies would be expected. Dogs' nutrient needs are lower, so the content in dog food is often less concentrated. 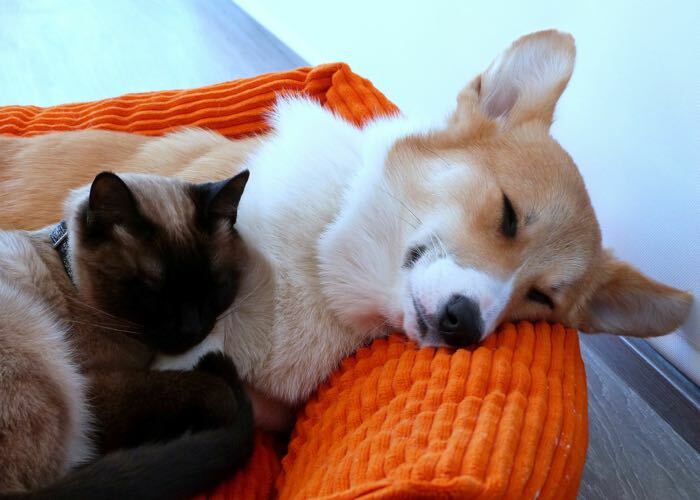 Q: Do you have any tips for keeping my dog out of my cat's food, and vice versa? Dr. Leslie: Cat food is very tasty to dogs. They can be obsessed trying to get into Fluffy's bowl. A "creep feeder" is a feeder that the cat can get into, but the hole is too small for the dog. This is one way to keep Fido from Fluffy's food. While you're keeping your pets' food separated, treat them to their own special snacks, too. Try Milk Bone® GravyBones® Biscuits for your dog, and for your cat, Meow Mix® Irresistibles®. Photo Credit #1: "Zoe" by Paul L Dineen via Flickr. License info. Photo Credit #2: "Best Friends" by Lottie via Flickr. License info.